How tall is Kid Ink? Brian Todd Collins, better known as Kid Ink was born in Los Angeles, California, USA (April 1, 1986) who is a rapper, and singer-songwriter. He made his single debut with “Hero” in 2011. 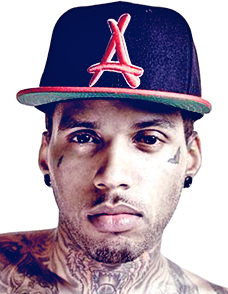 Kid Ink released his first studio album “Up & Away” in 2012. It was released by Tha Alumni Music Group. Kid Ink has released 3 studio albums, one EP, 6 mixtapes and 19 singles. What are the most popular songs of Kid Ink? What are Kid Ink’s record labels? Kid Ink’s record labels are Tha Alumni Music Group, 88 Classic and RCA Records. How much does Kid Ink weigh? Kid Ink weighs 141 lbs or 64 kg. Who with did Kid Ink collaborate? Kid Ink collaborated with rappers including Usher, MGK, Dizzy Wright, Sevyn Streeter, Rich Homie Quan, Honey Cocaine, Meek Mill, DeJ Loaf, Wale, and Elle Varner.